This letter to the Daily Herald from Edward F. Kublank originally appeared in the July 7, 1955 paper and is reprinted here courtesy of the Daily Herald. Mr. Kublank was born in Schaumburg Township in 1881 to William and Maria (Sunderlage) Kublank. (Pictured below) The family had eight children and lived on a farm that straddled both Plum Grove Road and the border of Palatine Township. That plays into the context of the letter that he wrote after the Palatine Centennial Book was published in 1955. He is, most likely, writing mainly from memory. I clarified some parts of the letter, and any mentions will be in a separate paragraph immediately below. We are fortunate that Mr. Kublank did what most never do and that is write his family’s history. The beautiful part is that he included wonderful anecdotes and interesting details that come only from those who have heard the stories over and over again. I have recollections of Schaumburg township from my parents and grandparents and have that from as far back as 1828 or 1830. While it is that far back, I would not know exactly what year or years all this came to pass, if it was 1828 or 1830. But since 1834 I have it about correct. I will start with those years, 1830 or 1828. Those were the years when the Pottawatomie tribe of Indians departed this Indian territory for Iowa and Nebraska west of the Fox river in Illinois. Another tribe of Indians were the Black Hawks and farther northwest, the Algonquin tribe of Indians ruled. There may still be such a tribe as Algonquin in Oklahoma or New Mexico. But the Black Hawks and Pottawatomie tribes consolidated with other tribes. 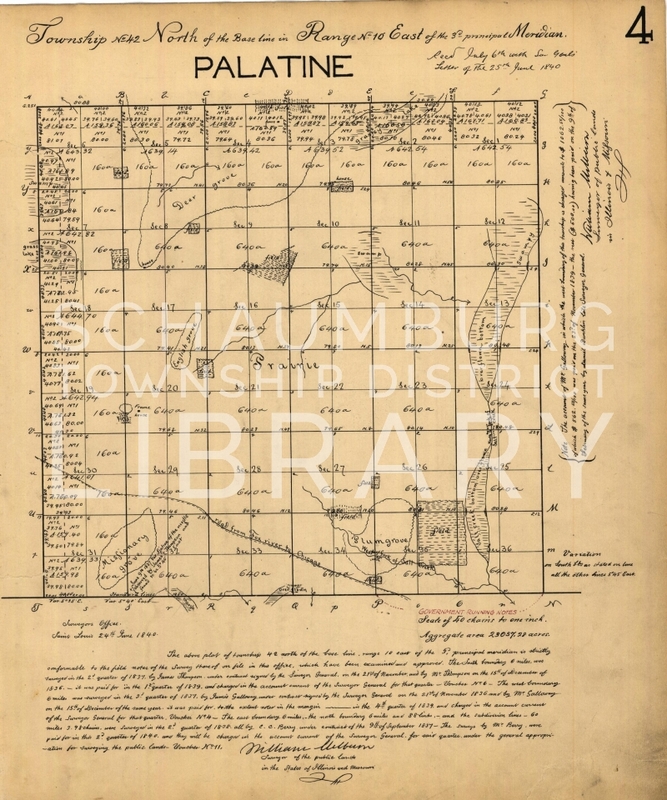 To begin the part of the history of Palatine township and village, one must consider that in 1850 and later this was not laid out in township or as the Illinois state statute states that a township or town shall be the same meaning. This Schaumburg township was laid out as a town in the later 1850’s. Its name was taken from Germany. The first settlers were those that flocked from New York and other North Eastern states. My grandfather John S. Sunderlage and his friend Gerhardt Greve, came from Northern Germany in 1826. For several years they worked on the Erie Canal (helped build it) in New York state, then from there they made their long journey on a small boat over the lakes to Chicago and worked on the Illinois-Michigan call from Chicago to the south of Joliet. This canal has not been in use since 1892. 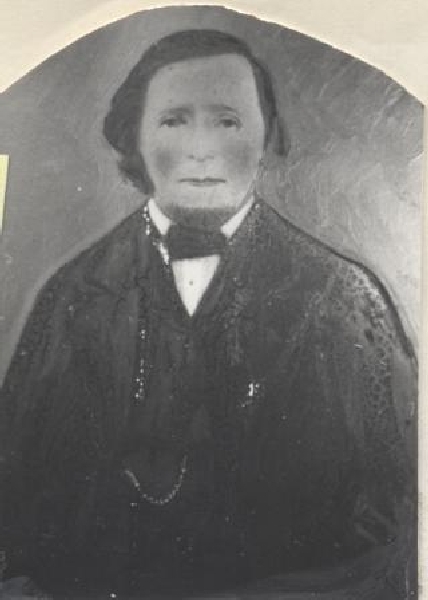 In 1830-32 my grandfather, John S. Sunderlage (a bachelor 30 years), arrived in Illinois and as he was a land surveyor in Germany, he was one of the men to survey the northern part of Illinois, shortly before that time Indian territory. You may know from other history of Illinois that in those years 1837-40, Chicago had a population of about 40,000 people. 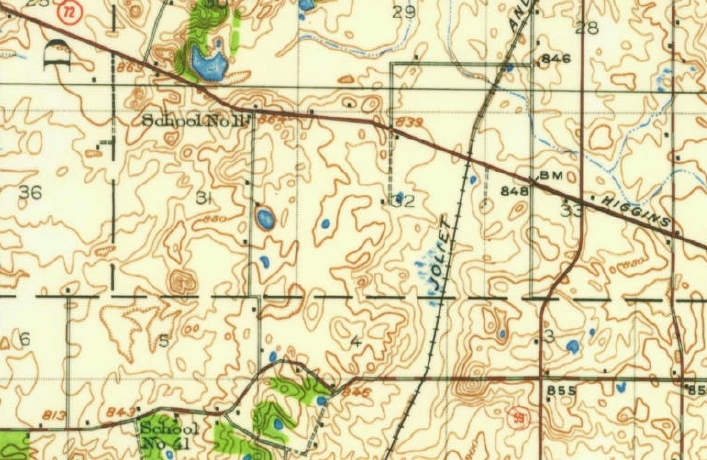 The old Indian boundary line starts south of Norwood Park and runs to Naperville, DuPage county, and then west, North of that line was Indian territory until 1830-32. It was this territory that my grandfather helped to survey out into farms. He worked here, but was as far west as Freeport. When the surveying was in progress, one Fourth of July all the men working at surveying wanted to have a celebration. They all came together at a point in what is now Hanover township by the 3 high peaks (mountains) located just south of Higgins concrete road about half way from the Schaumburg line to Dundee. There stood three very high peaks about 125 ft. high and were all stones, boulders, etc. No horses or cattle could get up on them and I doubt if any person was up to the top of them. That is where the July 4th celebration was going on. They had eats and drinks. Some of the men drank too much and lost some of the surveying papers and then had to measure the land all over again. After the surveying was completed, my grandfather, John Sweetheart Sunderlage, went back to Germany and stayed 2 years. He left here because there was no work and because he was not a U.S. citizen. He could not claim 160 acres of land to settle on at $1.25 per acre. But the Easterners from the north eastern states came here as fast as leaves drop off a tree in the fall of the year to file claims on land and after they had lived on it for a few months, sold out their claims to people from Europe and the Europeans had to live on it for three more years and pay $1.25 per acre for the land. My grandfather came from Germany 2 years later. He was still a bachelor and brought three other families along from Germany. Some of their descendants now live in Palatine. Three of these parties, including my grandfather, each bought 240 acres of land all neighbors and all related somehow, in Schaumburg township, along what is now Higgins road. At that time roads were Indian trails. Those farms lay in the northwestern part of Schaumburg township. One of the farms is owned now by a grandchild of one the original owners more than 100 years ago. His name is Benjamin Meyer, Route 3, Palatine. One other descendants of one of the farm owners lives around there, William Greve, and another one, Emma Steinmeyer and Edward Sunderlage on Higgins road, Route 3, Palatine. 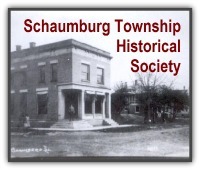 Schaumburg became a township in the 1850’s. Schaumburg produced the first republican lieutenant governor of Illinois. Mr. Hoffman, later called Hans Bush Bauer, went to Wisconsin and bought 700 acres land for an experimental farm near LaCrosse, Wisconsin. He lived here in Schaumburg township for several years, and preached in the Schaumburg church. Schaumburg produced inventors. The Maytag makers of washing machines lived as tenants on a farm later owned by the Schuenemans. They also made automobiles. 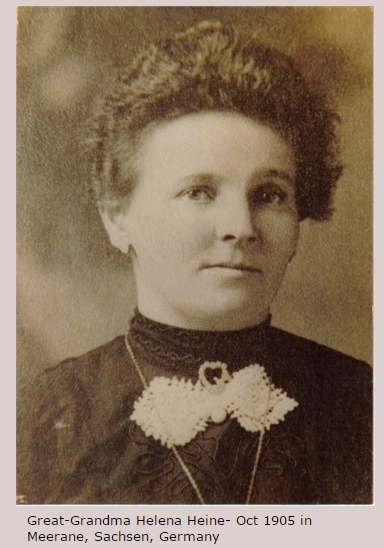 Schaumburg produced the first woman attorney-at-law of Illinois who lived on a farm east of where I resided. Her name was Bradwell. Later they owned a farm west of Palatine. [Fred L. Maytag: A Biography documents Mr. Maytag’s birthplace as Cook County. If it was Schaumburg Township, there was a William Schueneman who owned property on the west border of Schaumburg Township at the southwest corner of Schaumburg and Barrington Roads. There was also Fred Schueneman who owned a farm on Central Road. It could have been either family, but was more likely William Schueneman because he was more prosperous and had more property. The automobile reference is something new. It is possible, as Randy Schallau said in the comments below, that it was the Maytag-Mason Automobile Company out of Waterloo, Iowa that operated from 1910-1912 and was founded by Frederick L. Maytag. Schaumburg produced public school teachers. One was my sister, Rosa M. Kublank, who taught for 30 years. Palatine produced inventors. The Bradley plow had its origin on a farm now owned by Ernest Plote. It was a wooden plow, but Furst nailed saw blades on it and was therefore part steel. [Rosa is pictured in the photo above. She taught for a number of years at the Schaumburg Township District 52 one-room school that was on Plum Grove Road, two farms south of the Kublank farm. She died in 1955, the same year this letter was written. Alexander Hamilton was the inventor of the first wooden plow nearly 400 years ago and John Deere invented the first all steel plow. This Bradley plow was made later by Furst X. Bradley, Chicago factory. In 1908 it was sold out to Sears Roebuck & Co. The man who built the first high brick building in Palatine was a farmer in Schaumburg township, Mr. Botterman. He has two sons. He built a brick building in Palatine for one son and built a brick store building in Arlington Heights, now owned by Gieseke store in Arlington Heights. The Horstman family all came from farms in Schaumburg township nearly 100 years ago. [It seems Mr. Kublank was confusing Batterman and Botterman. The Batterman Brick Block building in Palatine was built in 1884 by Henry C. Batterman. It was three stories tall and was the pride of Palatine. When Henry died in 1902, he left the Brick Block to his grandsons, Dr. William Abelman and Dr. Henry Abelman. The building was demolished in 1938. It had already been gone 17 years by the time Mr. Kublank was discussing it. 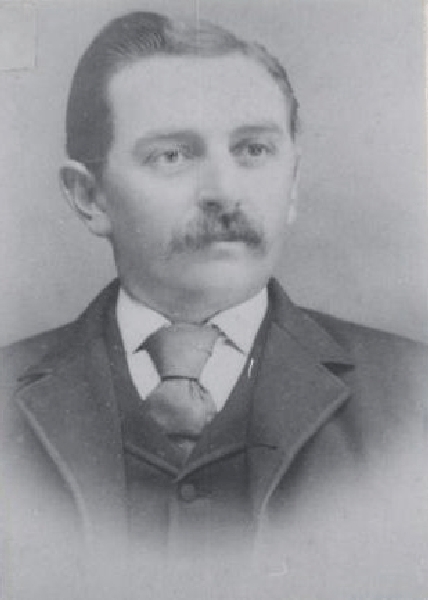 According to the Illinois Digital Archive, the Gieseke store in Arlington Heights was originally built by William Batterman in 1891 who operated it as a general store. He sold it to R. L. Precht who then sold it to Fred W. Gieseke in 1907. Gieseke operated it until his death in 1947 when his son-in-law took it over and ran it until 1965. 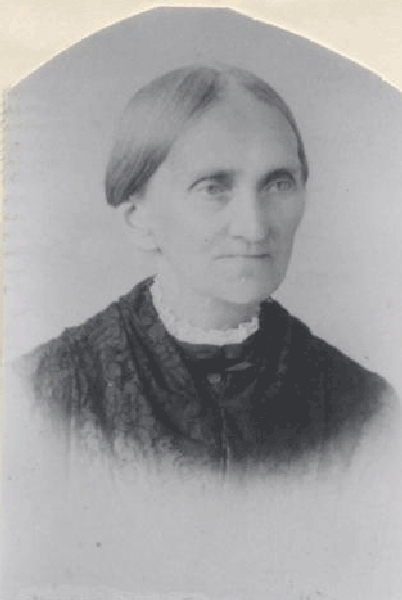 The first white child born in Palatine or Schaumburg township was Mrs. M. Huenerberg who later resided on a farm on Roselle Road and was an aunt of Amanda Schoppe, now a resident of Palatine. Salt Creek, the drainage creek south of Palatine, received the name this way. In Plum Grove on the west side of the woodland, was a place where the farmers drove through the creek with loads of produce. There were no bridges here at that time. One farmer returned from Chicago with a barrel of salt on his wagon. As he drove through the ditch the barrel of salt rolled off the wagon box into the ditch in four feet of water, so he put up a sign by the ditch. “Beware of the salt in the creek.” (The barrel). So the creek kept that name. Plum Grove got its name because one time there were a lot of plum trees on the west side of the woodland. But for the last 75 years very few plum trees remained. I was the first person who graduated from a law college many years ago. One brother, Herman J. Kublank, was the first printer born in Schaumburg township and worked at the business in Chicago for many years. 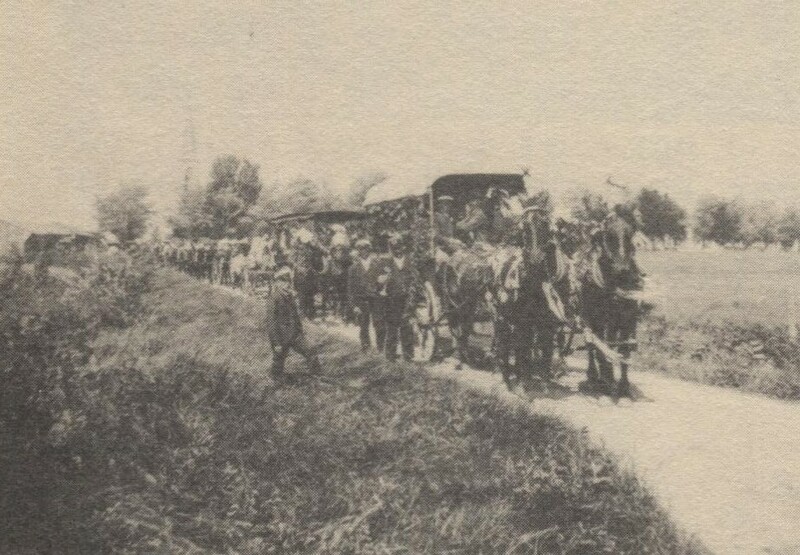 My grandfather Kublank and one Mr. Babcock of Palatine township had the first four wheel wagon in the community. My grandfather, John S. Sunderlage bought the first mower and reaper in this community. It was a Mannies mower and reaper raked off the grain by hand. He did custom work for the other farmers. My grandfather built the best house in Schaumburg township, hauled all lumber, sand and brick from Chicago. The house stands there yet as solid as Stonewall Jackson stood in war times. Mr. Thurston of Palatine built the house in 1856. The house is a three story house. The walls are lined with bricks on the inside. [The Manny Combined Mower and Reaper was invented in 1853 by John Manny in Rockford, IL. Thank you to Mr. Kublank for providing us with details that illuminated our history! The photo of William and Maria Kublank is courtesy of Betty (Sunderlage) Getzelman. 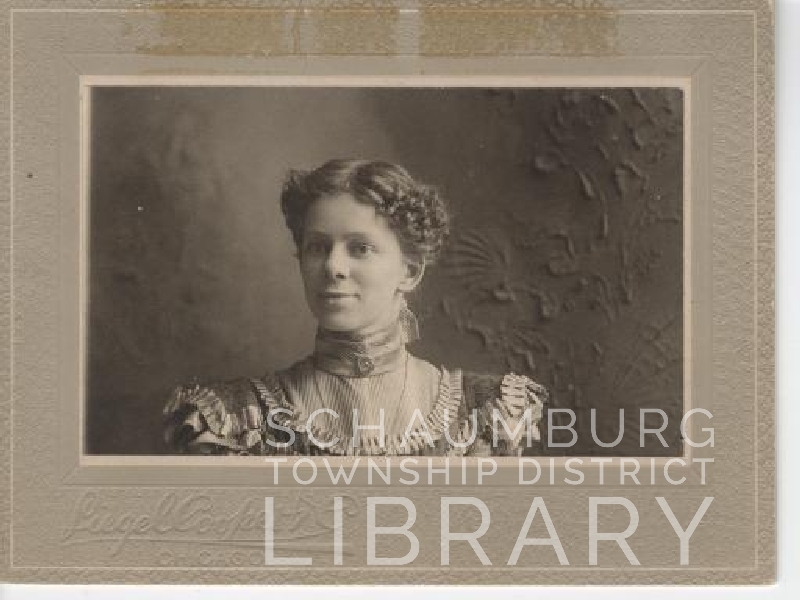 The photo of Rosa Kublank is courtesy of the Schaumburg Township Historical Society. In August, 1918 William Thies from Schaumburg Township received a letter from the President of the United States. 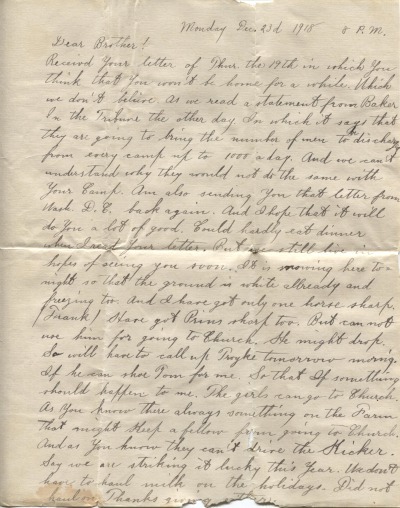 The letter informed him that he should report to the Village Hall in Des Plaines for induction into the military service of the United States. World War I was raging and the Allied Forces were successfully advancing. To finish the effort, the United States was still enforcing the draft and Mr. Thies was one of a number of men from Schaumburg Township asked to serve. After reporting on September 4, 1918, Mr. Thies and the other inductees boarded a train for Camp Grant in Rockford. After a short stay there, the troops made their way to Camp Hancock, GA which was near the town of Augusta. While William was enthusiastically experiencing life outside of Schaumburg Township for the first time, his family was at home sorely missing him. Yes, they missed his strength and his extra pair of hands but it was his warm, outgoing personality and ready conversation that was lacking in the family circle of his mother, brother and three sisters. 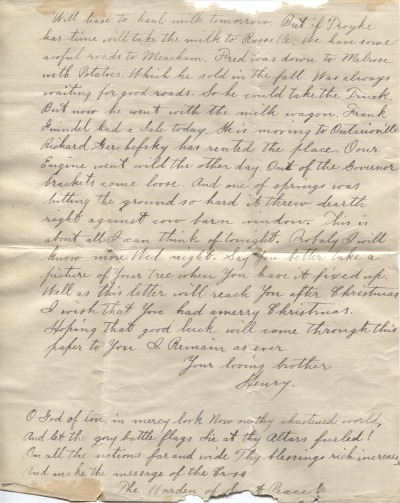 Monday December 23d 1918 8 P.M. Received your letter of Thur. the 19th in which you think that you won’t be home for a while. Which we don’t believe. As we read a statement from Baker in the Tribune the other day. In which it says that they are going to bring the number of men to be discharged from every camp up to 1000 a day. And we can’t understand why they would not do the same with your Camp. Am also sending you that letter from Wash. D.C. back again. And I hope that it will do you a lot of good. Could hardly eat dinner when I read your letter. But we still live in hopes of seeing you soon. It is snowing here tonight so that the ground is white already and freezing too. And I have got only one horse sharp. Frank/have got Prins sharp too. But can not use him for going to Church. He might drop. So will have to call up Troyke tomorrow morning. If he can shoe Tom for me. So that if something should happen to me. The girls can go to Church. As you know there always something on the Farm that might keep a fellow from going to Church. And as you know they can’t drive the Kicker. Say we are striking it lucky this year. We don’t have to haul milk on the holidays. Did not haul on Thanksgiving either. And let the gory battle flags lie at thy Altars furled! The Warden of Sweet Peace! With that prayer at the end, the relief of having the war over and peace declared is palpable. The minutiae of everyday life, however, also fills the letter and certainly conveys how much he is missed—especially at this time of the year. Considering how important Christmas church services were for these good German Lutherans, this must have been particularly tough for the Thies family. His family’s Christmas prayers were answered, though, on January 15, 1919. On that day William Thies Jr. was honorably discharged from the United States Army. But, that brief, five-month period had changed him. From that time forward, his journey from his little corner of Schaumburg Township profoundly influenced the way he farmed, raised his family and thought about the world. On September 3, 1903, Schaumburg Township had its own version of a royal wedding. Miss Emma Rohlwing married Fred Pfingsten at St. Peter Evangelical Lutheran Church in the largest wedding the area had ever seen. Considering the population of the township was 1003 at the time, 3000 guests was quite a number. For any wedding. According to an extensive article from the Chicago Inter-Ocean magazine, before the festivities even began, there was a great deal of preparation that went on in the weeks and months beforehand. Gooseberries were canned, cucumbers were pickled, pears were bottled in old burgundy and sauerkraut was put in crocks that were weighted down with stones. Early on, the best cattle were put in pastures that had never before been used and the pigs were fed the biggest red ears of corn. In January the pigs were slaughtered and the hams and shoulders were smoked, the feet were put in brine, and headcheese, a form of cold cut, was carefully stored in the cellar. On Monday, August 31, three days before the wedding, about 20 neighbor ladies came to the Pfingsten farm to begin the baking. Against the stone wall of the foundation of the barn, Mr. Pfingsten had created a large Dutch oven so that large quantities of bread and cakes could be baked. A number of new wash tubs were used as the mixing bowls (and later to hold the potato salad on the wedding day.) The dough was spread out on soap-stone bricks which were then placed in the oven. Chocolate cakes were mixed in the same washtubs and stacked nine layers high. Within the next few days the men were putting up the tents that would shelter the bridal party, serve as the food tents and cover the small tables where pinochle would be played. The largest tent covered a wooden platform that would serve as the dance floor. Two big wagons of beer that had been purchased in Elgin were unloaded. Ice that had been cut from the Fox River during the previous winter was piled over the kegs that were placed under yet another tent. Finally, the big day arrived. At 9:00 in the morning, the Burlington Cornet band of Elgin and the Blue Ribbon band of Bartlett pulled up to the Rohlwing house with the horses bearing plumes and the drivers in uniform. After a slight delay, Miss Rohlwing and her attendants, Miss Emma and Alvina Pfingsten, sisters of the groom, Miss Martha Pfingsten, the bride’s sister, Miss Annie Kruse, a friend, and Hermina Rohlwing and Aggie Thies, the flower girls, all made their way in the bride’s carriage towards the Pfingsten farm. It was the custom for the bride to meet her husband–to-be. Accompanying the groom were Hermann Wilkening, Hermann Fenz, Henry Lichthardt and William Lenschow. With no obvious superstition regarding the groom seeing the bride before the wedding, the bride’s party then returned to her home where her father smashed a bottle of red wine brought from Germany. 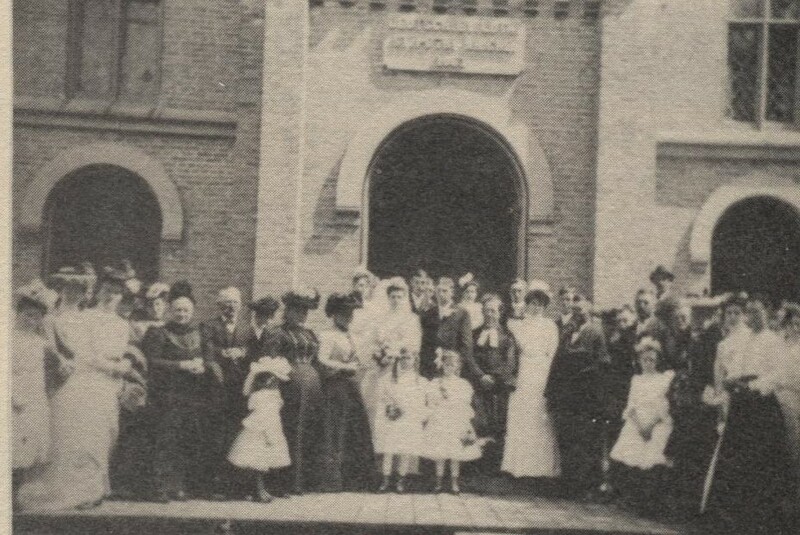 As the bands led the way, the bridal party set out for the church where nearly 2000 people met them for the service. Pastor Mueller met them at the door and gave them the blessing. The bands, having already made their way to the loft, accompanied the organist in playing the Wedding March. After the service, the bridal party, bands and many guests made their way back to the Pfingsten home. Pastor Mueller once again gave a blessing for the festivities and the party began! The dancing and singing was as voluminous as the food, with the bands playing on through the night to the delight of all those who stayed. Remember, the animals still needed to be fed and the cows milked in the evening and morning on the farms of the guests. With so many German families in attendance who knew each other well, it must have been difficult to tear themselves away from the dancing, the talking, the eating and the drinking. The generosity of the Pfingstens and the Rohlwings–who actually split the duties and the cost of the wedding–must have been well appreciated by those who attended. The event was big enough to make a Chicago paper and was likely talked about for weeks afterwards. If we compare the two weddings and their times, William and Kate had nothing on Fred and Emma in 1903! This posting was written with the assistance of an article from the September 3, 1903 issue of the Chicago Inter Ocean magazine. 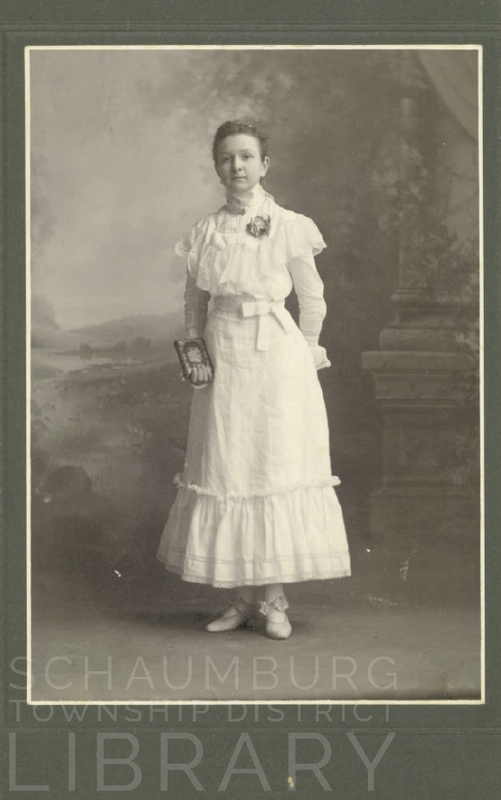 The photos are from Rohlwing Family History by Elmer J. Pfingsten. On a summer afternoon a few years ago, a gentleman came to the Reference Desk with a nice little treasure. As he explained to me, he is a collector of old documents that he routinely buys at estate sales and auctions. One of his recent finds was a group of papers that dated back to 1852 and concerned the Charles Leiseberg estate. He had made copies and generously gave them to the library. 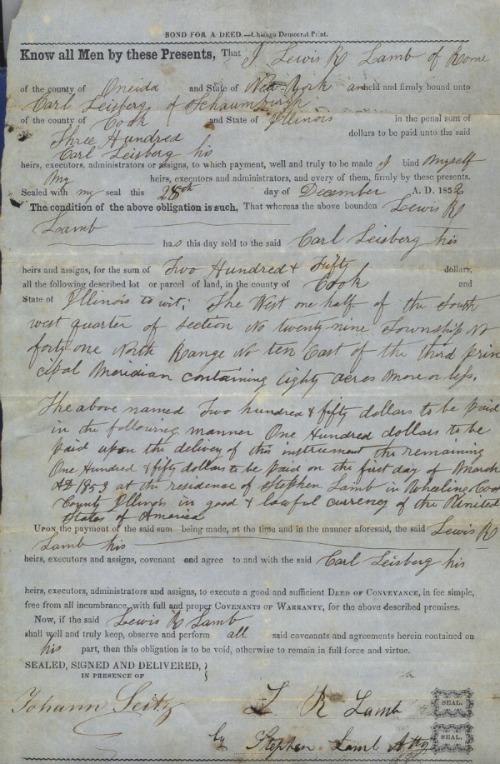 Charles Leiseberg was German and interested in farming so, upon his arrival in America, he purchased a parcel of property from Lewis Lamb, one of the first land patent holders in Schaumburg Township. 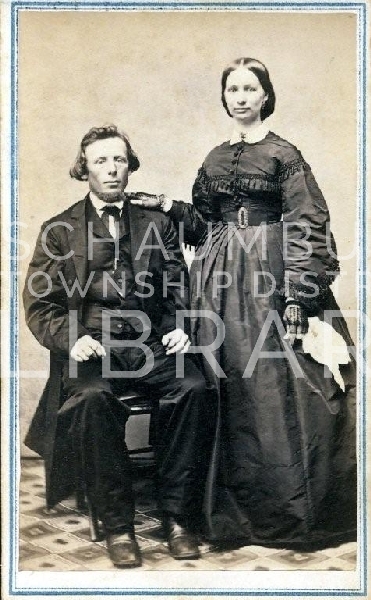 (For a list of these original land owners, see Schaumburg Township Land Patents by Bonnie Cernosek in the Local History Digital Archive.) It is quite probable Mr. Lamb bought this land for speculation since he was residing in Rome, Oneida County, New York when the property was turned over to Mr. Leiseberg on October 21, 1852. His son, Stephen Lamb, of Wheeling, acted in his stead. Most of the rest of the documents are agreements and indentures concerning the property—except for one. It is called an altenteil. This, according to Pete Noll, former Farm Program Coordinator for the Volkening Heritage Farm, is an agreement that arranges for the care and maintenance of an older farmer on his own farm once he is past the age of farming. The agreement is usually arranged between the farmer and a son and not only secures the care of the farmer and his wife, but also keeps the farm in the family. Apparently these types of agreements were somewhat common in the German family. According to H.W. Spiegel, in an article entitled, The Altenteil: German Farmers’ Old Age Security, sometimes these agreements worked and sometimes they didn’t. Obviously the potential for a tense situation could grow as the parents aged. We’ll never know how well the Leisebergs got along on their farm once this document was signed but the property did stay in the family. 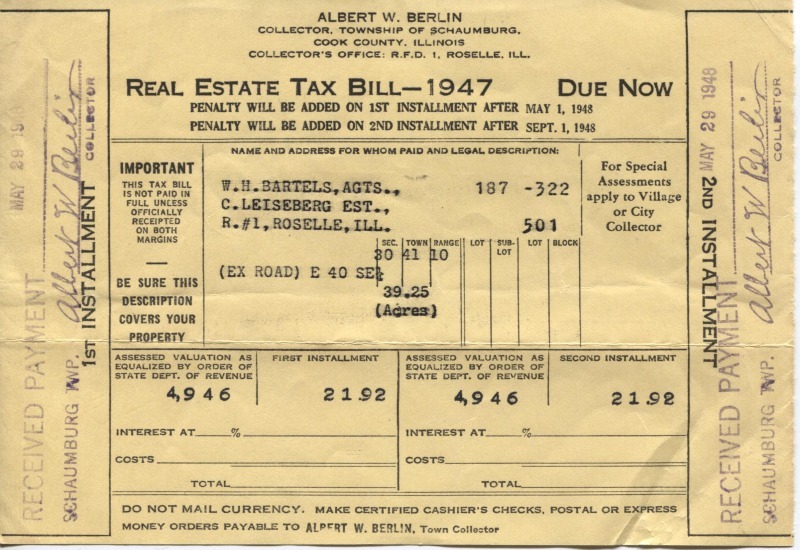 In fact, upon the death of Charles Leiseberg, the son, the property passed to the family of his wife, the Bartels–as the 1947 tax bill below indicates. You may be wondering what this property is today? Well, if you’re in the Culvers at Irving Park and Wise Road, you are on Leiseberg property. Mr. Leiseberg couldn’t have dreamed a Culvers should maybe be part of his altenteil! Once upon a time, instead of a clock tower on the corner of Schaumburg and Roselle Roads, there was a general store. 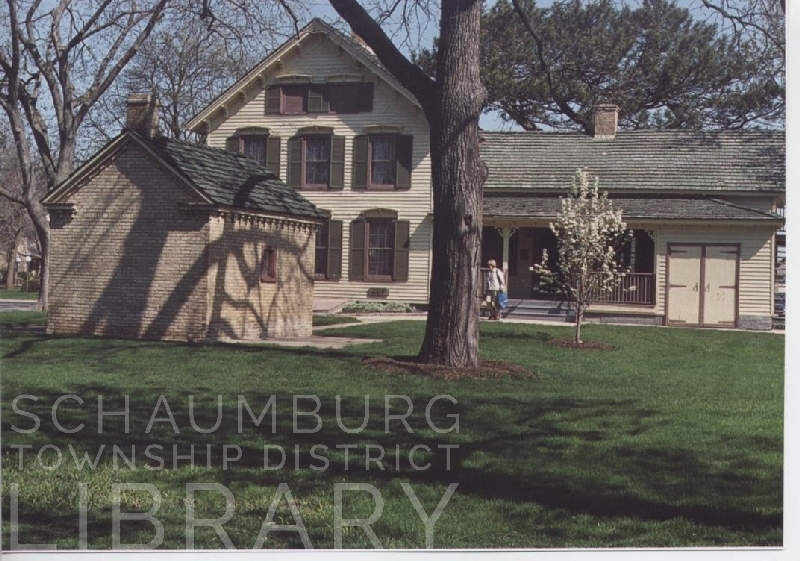 It was called the “Schaumburg House.” It opened in 1858 with Heinrich Rohlwing as the proprietor. 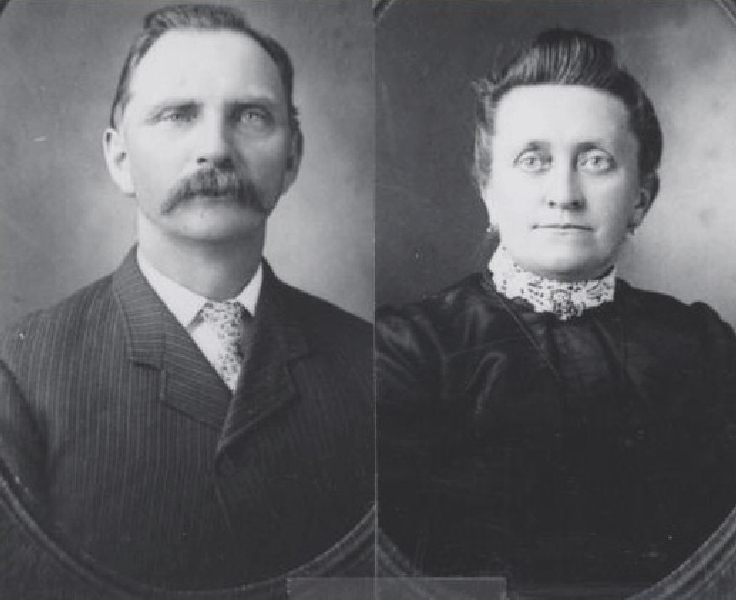 Heinrich was born in Schaumburg, Germany on Sept. 5, 1826 and came to the United States with his parents, Christoph and Eleonore (Gellermann) Rohlwing, in 1851. Here, Heinrich met and married Wilhelmine (Freyse) on April 18, 1852 in St. Peter Lutheran Church. During their married life, Heinrich was a busy man. He owned and farmed land in the far northwest portion of the township and, later, bought property on the west side of Roselle Road near the intersection with Schaumburg Road. By the 1860 census, Henry’s occupation is noted as Merchant. The Schaumburg House sold general merchandise, served as a saloon, hotel and community hall and as a residence for his family. In fact, a few of the early township elections were held in his house, presumably because of the centralized location of the store in the township. He did his part for township government as well. He served as Town Clerk from 1862 to 1866, as mail carrier in 1867 and as postmaster in 1869. Again, the convenient site of his business must have deemed him a natural for these necessary tasks. Unfortunately, this active, involved man died at the early age of 43 on March 13, 1870. In the nearly 18 years of his marriage, he and Minna had eight children. Only three–Caroline, John and Louise–survived him. Minna remarried the following year on September 22, 1871. This husband, Heinrich Meyer, died three years later in 1874. Minna kept the store going until a fire in 1881. According to the Chicago Tribune, “The large general store, warehouse, barn, wagon-shop and blacksmithing shop belonging to the Widow Rohlwing, and situated in Schaumberg, Cook County, burned last night, scarcely any of the stock being saved. The fire originated in the barn, seemingly being the work of an incendiary. All the buildings were frame. The loss is from $10,000 to $12,000.” Six years later, on June 18, Minna lost her 21 year old daughter, Louise, to tuberculosis. Minna did not have an easy life. 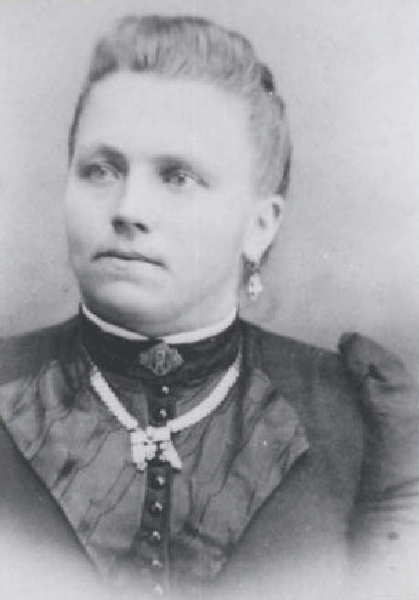 Her daughter, Caroline, married John Fenz, another industrious man in the township. He and his father owned and farmed various parcels of property and, at some point, after the destruction of the Schaumburg House, John and Caroline rebuilt the store. It continued to be named Schaumburg House but the name was eventually changed to J. Fenz & Son General Merchandise. 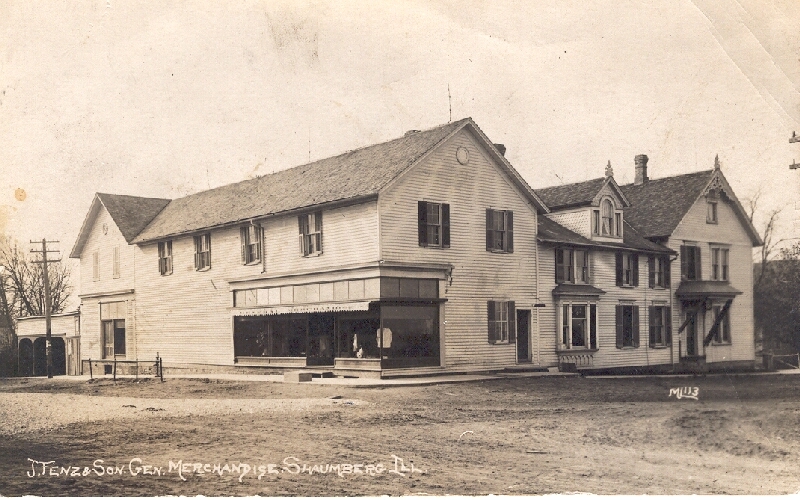 It is suspected this happened either after a later remodeling when the building looked like the photo below or when John’s son Herman joined his father in business. John Rohlwing went on to marry Louisa Lichthardt and had nine healthy children of his own. They farmed just over the border in Elk Grove Township and, in fact, the barn that recently came down on the Busse Woods Forest Preserve property was on the former John Rohlwing farm. In 1909, at the age of 48, John accidentally scraped his left leg against a cultivator and died several weeks later from the resulting infection. Minna had died of influenze three years before John in 1906 at the age of 82. Caroline was the last of the third generation and died in 1918 at the age of 63. The Rohlwing name lives on, not only in the annals of Schaumburg Township government, but on Rohlwing Road that bears their name.